This is the third book in the children’s fantasy series featuring Max Hamby. The battle at Dunmere is over, the first two stones have been found, and Milo is safe. But, Milo’s mom and grandma are now trapped with Max’s parents in the Shadowlands. They will fade away and cease to exist unless the other stones can be found. Max, along with friends and family, prepare to journey to find the next stone, but his plans are thwarted. In a bold move, Isolde sends the Trith to Merrihaven with a message and two strange children are chased from the Downs by an enormous ogre. Birdie and Basil Salisbury have awakened from a two-hundred-year sleep with a dark secret. One is good and the other is evil. Both are set to become pawns to gain the stones. It is up to Max to find out who Birdie and Basil are and what they want. Busby Stoop—that’s where the closest Elemental Stone lies, and Max Hamby has to find seven of them to save his parents from the Shadowlands; but as he makes plans to go there, the dangerous Trith, which turn out to be two innocent people under Isolde’s command, enter Merrihaven with harmful intensions. With magic, he removes the threat and returns to his plans to find the next stone. In his bedroom, he is visited by his grandfather who gives him a bag that is limitless and two items (an hourglass and a watch) to help him on his journey. Then there is a commotion, and Milly Marietta shuffles by faster than they’d ever seen her move. That’s really funny because you know—it’s Milly Marietta! Wait…did she say there is an ogre infestation! First the Trith—now an ogre!!! Let us not forget the kids, a girl named Birdie, and a boy named Basil. From the moment, they are saved from the ogre and enter Merrihaven, Max senses an evil presence. Not to mention what Alice thinks. Didn’t I say not to mention that! As with Max Hamby The Blood Diamond Book 1 and Max Hamby The Emerald Hunt Book 2, Max Hamby and the Onyx Eyes Book 3 starts with a different character’s point of view. That’s the brilliance of Kathy Cyr and that’s what makes this book UNIQUE! This time, however, Max does not go on an adventure to find the stone hidden in Busby Stoop. In fact, as with the second stone, it comes to him…in two pieces. But—if he doesn’t go to Busby Stoop to get the stone, why is he there? 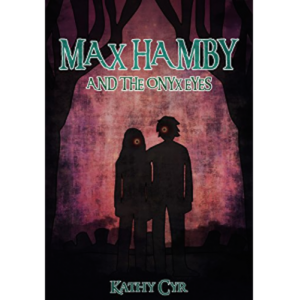 Max Hamby and the Onyx Eyes Book 3 is recommended for Middle Grade Readers. It is also a great book to read with older (6-8) First Time Readers. 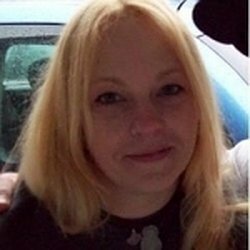 Kathy Cyr writes in an underground cave, but has her eye on a wizard’s castle. On an average day, she’s usually surrounded by a dwarf with a curious addiction to coffee, a moody dragon and a pink pixie with a large sweet tooth. When not writing books, she can be found daydreaming about faraway places, enjoying a cup of coffee with the dwarf, sharing a laugh with the moody dragon (when he’s in the mood) and sitting on a rainbow of treats with the pink pixie.